The 4- and 8-port Cisco® Gigabit Ethernet Enhanced High-Speed WAN interface cards (EHWICs) can reduce your company's total cost of ownership (TCO) by integrating Gigabit Ethernet (GE) switch ports within Cisco 3900, 2900, and 1900 Series Integrated Services Routers (ISRs). These low-density Gigabit Ethernet switches offer small to medium-sized business (SMB) and enterprise branch-office customers a combination of switching and routing integrated into a single device. Integration of these switches with Cisco IOS® Software allows network administrators to manage a single device using Cisco management tools or the router command-line interface (CLI) for LAN and WAN management needs. This approach reduces network complexity, lowers maintenance contract costs, and lessens staff training needs. It also simplifies software qualification efforts and delivers a consistent user experience at branch offices. 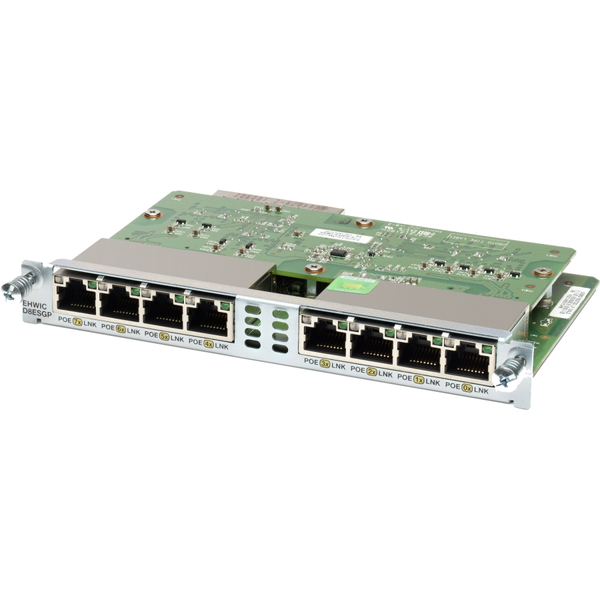 Additionally, these low-density Gigabit Ethernet switching modules enable Cisco's industry-leading power initiatives, Cisco EnergyWise, Cisco Enhanced Power over Ethernet (ePoE), and per-port Power over Ethernet (PoE) power monitoring, which enhance the ability of the branch office to scale to higher performance requirements and still meet environmental initiatives for IT teams to operate a power-efficient network. The 4- and 8-port Gigabit Ethernet EHWICs provide line-rate Layer 2 switching across onboard Gigabit Ethernet ports. The 4-port Gigabit Ethernet EHWIC has four 10/100/1000 switch ports, with options for PoE support on all four ports. The 8-port Gigabit Ethernet EHWIC has eight 10/100/1000 switched Gigabit Ethernet ports, with a PoE support option on all 8 ports. The new features for the Gigabit Ethernet EHWICs include: 8 quality-of-service (QoS) queues per port, Shaped Deficit Weighted Round Robin (SDWRR), dynamic secure port, intrachassis cascading, up to 20W of PoE per port, and PoE per-port monitoring and policing. Multigigabit Fabric (MGF) is enabled for direct module-to-module communication.